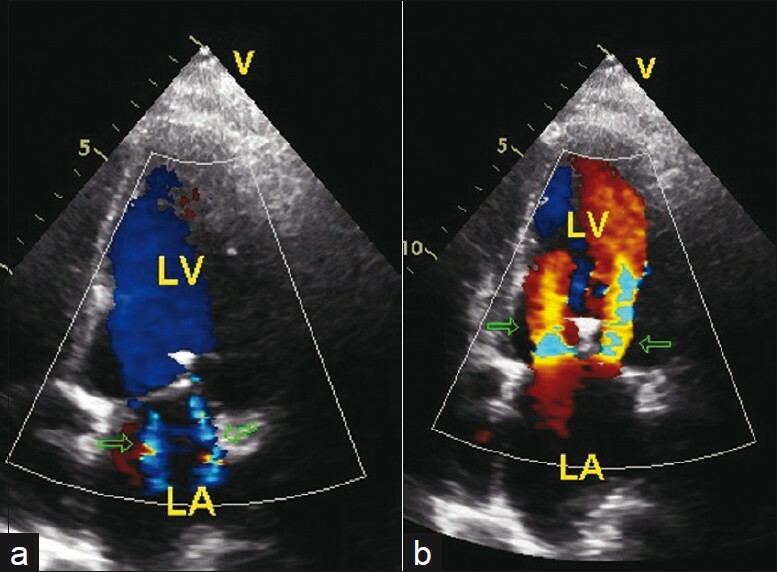 These echocardiography images are of a 58-year-old Palestinian lady, post coronary artery bypass grafting (CABG), with refractory heart failure, NYHA III/IV. Echocardiography examination showed severe mitral incompetence and an ejection fraction (EF) <30%. Because of co-morbidities, she was considered to be at high risk for cardiac surgery. She was referred for percutaneous mitral valve clip. A 6-month follow-up echocardiography study showed the clip in position [Figure 1] and [Figure 2] with mild residual mitral incompetence [Figure 2]a. Left ventricular dimensions and function improved, and the patient was asymptomatic.